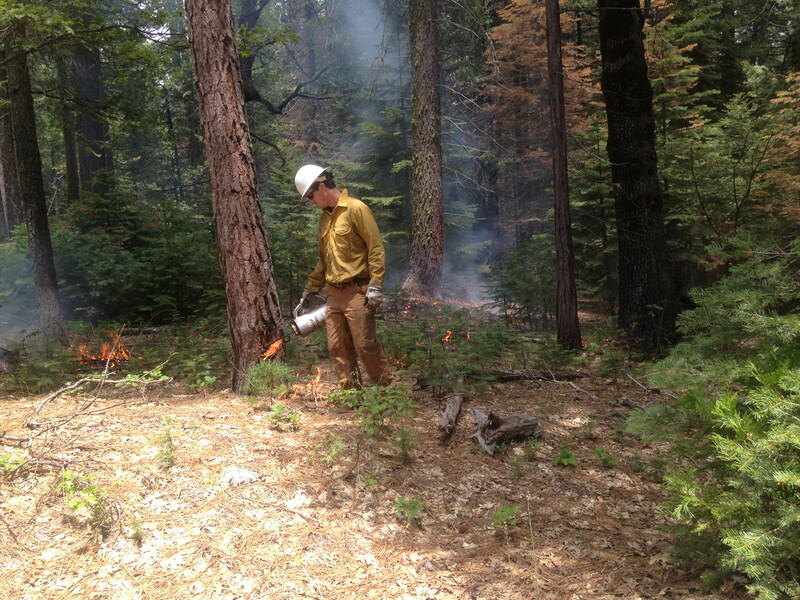 Stephen Byrd, SCE manager of forestry at Camp Edison and Shaver Lake, works on a prescribed burn. SCE forester Ryan Stewart (left) and Jeff Pierini, a reforestation specialist and wildlife biologist, tend a prescribed burn near Shaver Lake. Some trees were singed during a prescribed burn near Shaver Lake, but will regenerate while other overgrown vegetation was eliminated. Annual prescribed burns at SCE’s Shaver Lake help keep the forest healthy and safe from wildfires. But Byrd, Southern California Edison’s manager of forestry at Camp Edison and Shaver Lake, was eager to participate in this spring’s prescribed burns on the company’s 20,000 acres of forest in the mountains east of Fresno. “The best preventive medicine against a wildfire is a prescribed burn,” said Byrd, a 20-year veteran of forest ecology. SCE has conducted prescribed burns in the spring and fall on its forest land for more than 40 years. The forestry staff, many of whom have U.S. Forest Service firefighting experience, see prescribed burns as part of the company’s stewardship of its forest land. The burns remove overgrowth that could otherwise fuel a major wildfire. 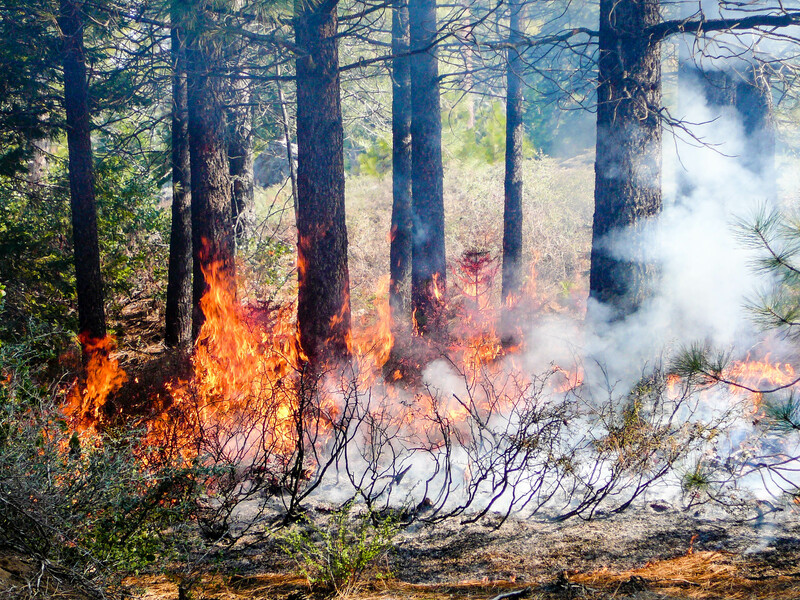 In addition to reducing the likelihood of a wildfire, prescribed burns eliminate vegetation that competes with the native plants and trees for nutrients and sunlight. The burns also stimulate native vegetation like deer bush, Carpenteria and giant sequoia, which depend on fire to reproduce. Jeff Pierini, an SCE reforestation specialist and wildlife biologist, uses a drip can to start a prescribed burn near Shaver Lake. The proof of the approach is evident. Much of Shaver Lake’s forest is thriving, attracting an abundant population of deer, squirrel, quail, birds, bears and mountain lions. “Prescribed burns keep the forest healthy,” Byrd said. SCE conducts the burns in phases after careful planning and under strict supervision and only on days when weather conditions — heat, wind and humidity — make it safe. After the flames abate, the staff continues to monitor the burned sites, where the fires can smolder harmlessly for weeks. This spring, SCE staff burned about 320 acres before the onset of very dry conditions. They will resume when conditions improve this fall. Fire is no stranger to this part of the Sierra Nevada. Native Americans used to call the area the “Little Smokies” because smoke from fires — some set by lightning and others by the tribes as part of their cultural tradition — could be seen throughout the mountains. SCE’s annual prescribed burns and Native American tradition came full circle this past spring. About a dozen members of the Cold Springs Rancheria of Mono Indians of California tribe visited Shaver Lake to learn SCE’s technique for prescribed burns. A prescribed burn can singe the lower parts of healthy trees but not cause any lasting damage. Jared Aldern, tribe administrator, said the tribe conducts its own version of prescribed burns called cultural burns, which historically have been done to help regenerate vegetation like plants for basket weaving and berries and oaks for the medicine and food that are mainstays of Native American life. This year, Rancheria tribe members worked one on one with SCE crews at Shaver Lake. Aldern said he was impressed by SCE’s whole approach, which mirrors the tribe’s beliefs. “They are truly focused on the forest’s health and fuel reduction,” he said.